The company will display a range of products at the Bangalore air show. Almaz-Antey, one of the largest companies in the Russian defence industry will take part in the Aero India 2017 international aerospace exhibition in Bangalore from Feb. 14 to 18, the company said in a press note on Feb. 9. The company plans to display its long-range anti-aircraft missile systems and medium-range air defence missile systems, sea-based, automated control systems, Redikom repair and diagnostic equipment, radar stations and radar systems for airspace control and ground surveillance. Almaz-Antey is one of the leading Russian state-owned companies in the arms industry. It produces weapons, as well as civilian products such as navigation systems, air traffic systems, civil air traffic- and weather radars, sewage cleaning systems, ventilation valves for nuclear power plants, and plastic packaging for cosmetics and food products. 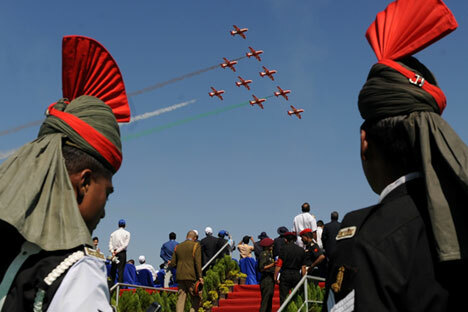 Aero India has been held every two years in Bangalore since 1996. Traditionally, this show is attended by the crème de la crème of the aerospace industry.